In 'Oor' #2 of 2018 Editors were the main feature. A pages long interview. One of the topics mentioned was on The Boxer Rebellion. Tom Smith said that Editors was once taken on tour as a support act of The Boxer Rebellion, but that now Editors played the largest venues while the Members of The Boxer Rebellion all had to take jobs to exist. What followed next was telling, about Smith and the band he was speaking about "and they still make records and tour in between. I don't know if I could do that". 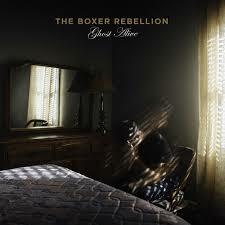 The Boxer Rebellion never really attracted me to its music much. The radio hit 'Diamonds' has its moments, but nothing much else. The words of Tom Smith made me decide to give Ghost Alive a fair chance. I'm glad I did. It is an intense and at moments extremely beautiful album. Like the picture on the album cover it holds light and shade where anything can hide in, but can't move without catching the light. In my mind I hear music that holds back, has elements of a misplaced bombastic nature without much of a memorable melody in sight. I promise to give some albums a second chance. It may well be I am sincerely mistaken. Ghost Alive seems in everything the opposite of what I had expected to hear. Yes, the mood is downcast and despite the many acoustic instruments there is this hint at bombast in the music. Yet when a band can present it in such a beautiful way, with these subtle chord changes, so smooth, so soothing, it seems it can simply do no wrong. Perhaps the band has learned a lesson: "You've got to love yourself". Could this simple sounding yet for some so hard to arrive at conclusion be the secret to Ghost Alive's success in my ears? The emotional tranquillity this frame of mind offered The Boxer Rebellion led to the inner beauty that was let out, result in the beautiful songs released on Ghost Alive? The music presented is soft pop, music to really listen to. Melodies may change, yet the chord changes are so soft that they are hardly noticed. Instruments are added without any loud crash or bang. They blend in and play their softly added notes. It could be a piano, a string section or organ. It simply doesn't matter. The mood is ever so slightly altered. Over all this the soft and high voice of Nathan Nicholson meanders. A voice of a singer is always a dominant feature in the sound of a band, Nicholson's voice provides The Boxer Rebellion its melancholy stamp. It holds a dreamy quality expressing a longing for something not present. The music is totally submerged in that longing and underscores it from all sides. The drums and bass laying the depth of that longing and the pace to get to the dreamed of destination. The acoustic guitar and strings provide the support and stamina needed to keep striving to get there. "I am not a lost cause", sings Nicholson in 'Lost Cause', I would say far from Mr. Nicholson. The Boxer Rebellion has breathed life into itself. Exit ghost, enter alive.